Reduce your HP by 500. 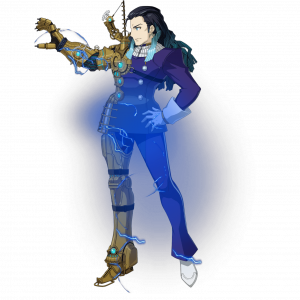 Overcharge: Deals extra damage against Earth or Heaven Servants. 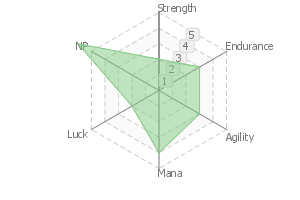 When equipped on Nikola Tesla, Increase NP damage of all allies by 20% while on the field. A genius and a scientist in the field of electromagnetism, during the 19th and 20th centuries who claimed he knew how to split the planet in two. While many mythologies regarded electricity as both a formidable force of nature and an example of divine intervention, it was Tesla (and other great minds) who helped unlock its mysteries, allowing man to harness its power. Mark Twain called him the Lightning Professor. The most handsome man around. 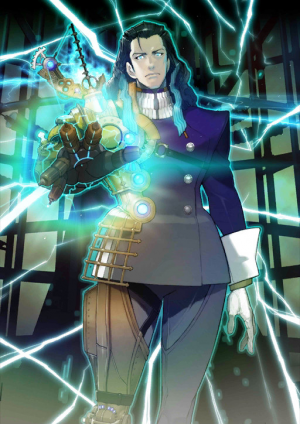 The worthy rival of Edison, king of inventors. The man who recreated Zeus' lightning on Earth. He is indeed a man of dazzling and magnificent wisdom. His attitude towards the Master can be summed up in one word: arrogant. He brought down to the world a power that only beings from the Age of Gods possessed and furthered human civilization, giving him an EX rank on this skill. Human Mythology, Lightning and Thunder Descend. 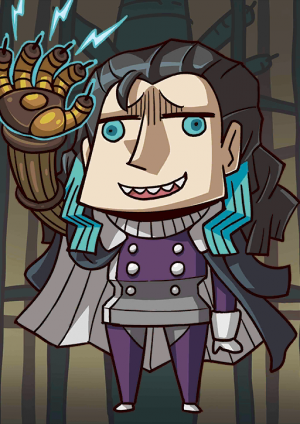 His achievements while alive and the supernatural legends that surrounded him eventually got sublimed in the form of a Noble Phantasm. Even prior to releasing its True Name, this is an extremely powerful electromagnetic manipulation ability. 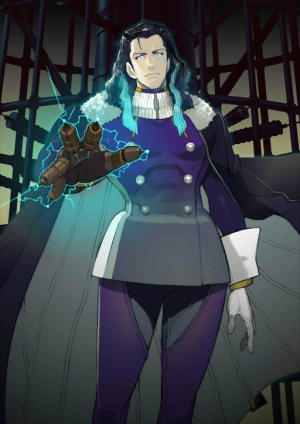 His Noble Phantasm, one that recreates the rage of thunder gods depicted in many different mythologies and brings it down to Earth, is what makes him for for the class of Archer. 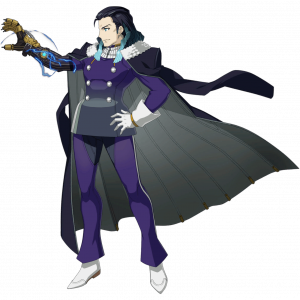 When he releases the True Name of his Noble Phantasm, he can create a limited "pseudo-dimensional fracture" and destroy the surrounding area. His wish for the Grail is "to complete the Nikola Tesla World System." The advent of a new world where electric currents can interact in space itself. In order to make this dream a reality, he will spare no efforts in cooperating with the restoration of human history. A genius scientist from the 19th~20th Century who controlled electromagnetism. A brazen prodigy, who proclaimed that he could even split the Earth in two. One of the great scholar who clarified the power of thunder and lightning, which is described in many mythologies as a legend of god (nature), bringing about "electricity" to human civilization. Mark Twain called him Professor Thunder and Lightning. An unique Skill bestowed to a hero who became a turning point in human history. 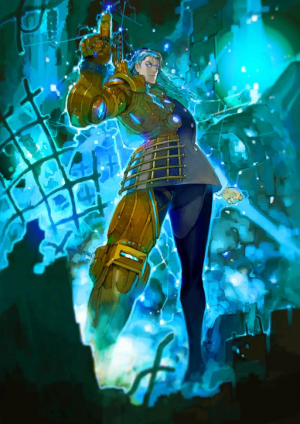 Having brought down to the world a power that was endowed only by beings from the Age of Gods and raised civilization up, he possesses EX Rank on this. 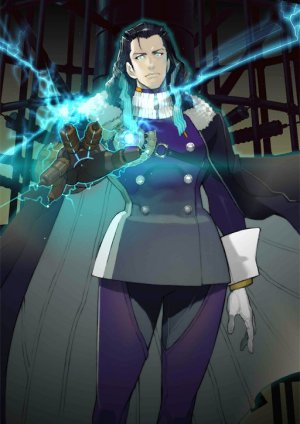 The existence of a Noble Phantasm that brings about to the world such a furious power, which gives the impression of a second coming of gods of thunder and lightning that are described in many mythologies, is what causes him to be an Archer. If he perform the release of the True Name, it destroys the entire surroundings by means of "the outbreak of a limited quasi-like space-time dislocation". His wish for the Holy Grail is "to complete the Nikola Tesla World System". The advent of a new world in which interacting electric currents come and go in space itself. For the sake of fulfilling this as well, Nikola Tesla will spare no efforts in cooperating with the restoration of human history. This page was last modified on 10 January 2019, at 08:48.